If you love to trade blows with some whitewater rapids, you are not alone. Over a quarter million kayaks are sold in the United States every year and the hydro-blasting sport is still growing in popularity. However, there is a major limitation to the traditional kayak that’s stopping the sport from growing as fast as it could. Due to it’s awkwardly large shape and heavy weight, storing and transporting these behemoths becomes a chore with the inconvenience quickly outweighing the actual fun you have with them. Using inflatable kayaks began as a quick substitution for traditional kayak as an extremely portable option, however these vessels perform well enough to be considered a permanent solution. The days of non-durable floaties is in the past, replaced by today’s tough and durable plastics that are built to last. Many kayaks even offer multiple-layered liners to keep the material extra secure. Most inflatable kayaks are small enough to be easily stored in the trunk of any vehicle. The set up is usually pretty simple and most models will take less than 10 minutes in total. This lightweight and durable build means transporting your inflatable kayak from land to water (or water to land) very easy to do. After a long day of paddling out in the water, the last thing you’ll want to do is lug a heavy and awkward boat back to your car. Instead, just deflate right out of the water and pack away your kayak in the included container. Inflatable kayaks are very affordable and there is certainly a model that fits anybody’s budget. For a quick trip with the gang or a family outing, you can grab most of these inflatable kayaks in a matter of days with rush shipping options. Whether you want to grab a performance model for yourself or a durable and cheap option for the kids, we have laid out the best inflatable kayak categories in our full-length reviews below. If you’re a little more serious about your kayaking and want a product that’s slightly more high end, the Sevylor K5 QuikPak is a great buy. This thing is loaded with extra features and is built to be tough, making this perfect for almost any kayaking environment. Let’s start with some of the pros of this inflatable kayak. This is one of the toughest inflatable kayaks we’ve used and Sevylor’s Airtight System is guaranteed not to leak. Multiple air chambers are used so you do manage to puncture the durable material, the other chambers will keep it afloat. Setting up the kayak takes about 5 minutes and it really is as simple as it gets. 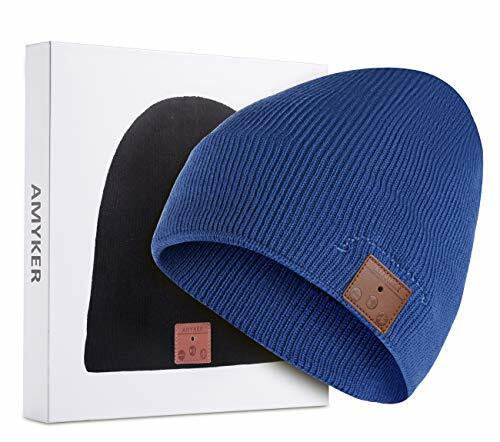 An outer skin is included that is made of even tougher material for added protection from punctures while the Tarpaulin lining keeps the bottom intact. Storage areas are held down with bungee cords. The only flaw I found with this model was the outer lining, which doesn’t fit as snug as I’d hoped. This doesn’t really affect the speed of the canoe although it could’ve been designed so that it would look better. To be honest, I’m just nitpicking here to find a flaw at all because frankly, this is basically the perfect inflatable kayak. Not everyone is looking to fork several hundred dollars for an inflatable kayak that they will only use once or twice a year. 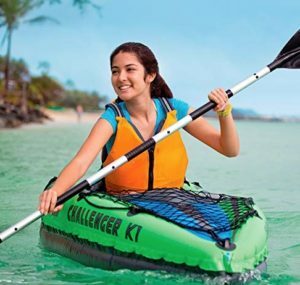 For the less enthusiastic enthusiast, the Challenger K1 Kayak might be the perfect option. This kayak is set a much lower price point but is still quite durable and has solid construction. One of the main benefits that often understated with the Challenger K1 Kayak is the lightweight construction. While there may have been some compromises in durability over rocks, this is one of the easiest inflatable kayaks to maneuver in the water. The lower price point also makes it a great buy in bulk for a group of friends or family members. Kayaking is fun but having a group of kayakers paddling together makes for some amazing memories. Some words on durability: even at the low price point this kayak is VERY durable and will work just fine for any average kayaker. The material is rather thick and I’ve had my dogs on this and wasn’t worried in the slightest that their nails would pierce the material. With that said, this doesn’t mean it’s not possible. Taking this through some raging white water rapids and slamming into pointed rocks is not something you’ll want to test. If you don’t have the space for a bulky kayak, the Advanced Elements AdvancedFrame Kayak is a perfectly viable option. Triple layered to be extra tough against damages and punctures make this one of the more durable models we’ve reviewed. 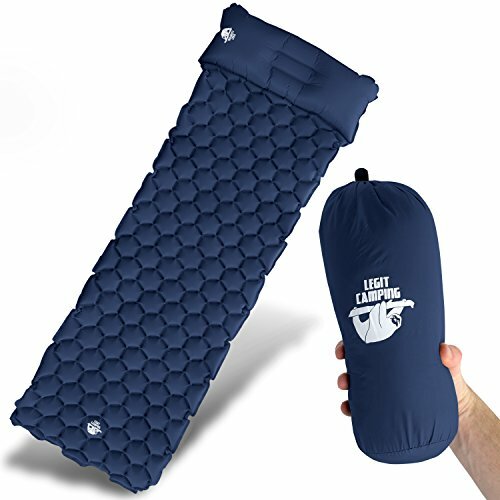 The padded seat is adjustable and has a high support backing to keep your back from aching on longer trips. The built-in aluminum ribs keep the kayak stable and give you superior tracking. If you can’t tell from the picture, the design is also very attractive and people were shocked to learn it was actually an inflatable kayak. While the three layers of material are quite durable, this kayak is rated for up to Class III rapids. This makes the Advanced Elements AdvancedFrame Kayak a hybrid capable of handling open waters or some Class III whitewater with no issues. While we had to give this kayak the runner up award for best kayak for a single passenger, this is still a very good kayak that is very fun in the water and built to last. The Sea Eagle SE370 Inflatable Sport Kayak Pro (whew that is a mouthful) is an absolute beast and will give you a smooth and enjoyable ride through the water for up to three people. This is not recommended but we’ve managed to fit four people on this thing and it did just fine, though we were well under the 650 lb capacity. This inflatable kayak is truly a beast and can handle up to Class III whitewater rapids. The durability on this thing is solid and made to last for years of abuse. Even with its solid construction, the kayak is also extremely portable and weighs 39 pounds when it is deflated. That is not bad at all for a kayak that can handle three grown adults with ease. This inflatable kayak was built to store people and there is very little storage room for other things. There are some pockets built into the backs of the seats but this won’t handle much except for some valuables. The Intex Excursion 5 is labeled as a kayak but it could really be considered a leisurely boat with its smooth ride and luxurious seating arrangement. If you want to take a single inflatable kayak out with your friends or family (and yes, dogs are considered family) then BUY THIS KAYAK. This kayak is much more stable than other kayaks due to its wide base and 3 air chambers, has comfortable seating that is wide enough for two, and is made with durability in mind. Due to the size of this party kayak, it is a little less portable running around 50 pounds in weight. Setting up the kayak takes a little more time but shouldn’t be a problem if you follow the included directions. A single person can row a fully loaded kayak on their own but it will be quite difficult. Having two people who are able to row is ideal. You can search online for some modifications others have made to this kayak including a small motor. This kayak is durable enough to handle some extreme modifications! At first glance, the Sevylor Coleman Colorado already looks like a fishing kayak with it’s green and black exterior that really makes a statement. The manufacturers list an 18 gauge PVC construction that is tough and rugged making it perfect for rough lake conditions. Tarpaulin bottoms and a nylon cover provide additional security against punctures. If that weren’t enough, there are multiple air chambers so to keep your inflatable kayak afloat even if you manage puncture this beast. Now what makes this kayak a “fishing kayak” are the rod holders so you can fish hands-free. You can easily add a motor to this model to really make your fishing trip one that concentrates on the fishing without exerting too much energy paddling out. Paddle holders are built in as well, keeping your paddles secure but out of the way. Plenty of storage is available in this inflatable kayak with the biggest at the stern. D-ring handles allow the kayak to be easily dragged and transported around. For all you dog lovers out there, the Sea Eagle SE330 Inflatable Sports Kayak is great for taking your dog out on the water. With a 500 lb capacity, this can even handle an adult and a couple medium sized dogs, assuming that they don’t get too crazy out on the water. The Sea Eagle SE330 Sports Kayak is stable, durable, and easy to maneuver. Getting in and out of the kayak is also quite easy. This might seem like a minor detail but being able to get in and out with minimal effort makes a big difference when you are loading or unloading your animals. Setting up the inflatable kayak is extremely fast and easy which is also a plus, especially when you have two impatient pups around. There are two things that we looked for in our search to find the best inflatable kayak suitable for kids: durability and a low cost. The Intex Explorer 200 covers these two bases beautifully. While this kayak can technically fit adults with enough durability to support them both easily, they won’t be quite as comfortable as the kayaks mentioned above. With that said, this inflatable kayak will still seat an adult and a child very comfortably. We’ve used this model to take the dogs out with a single adult and they absolutely loved it (dog-owners would argue that their dogs ARE their kids). This is a budget-friendly kayak and so, this thing won’t last you for years and years but it will make some great memories in the meantime. If you’re looking for a kayak that is built well enough to last many trips but won’t break the bank, the Intex Explorer 200 should be the one for you. Number of passengers: Inflatable kayaks come in all sizes, built to support a single person up to a party of five. When browsing through the different models, make sure that the maximum weight capacity is factored in as well. Cost of kayak: Your budget will certainly be a major factor in influencing the inflatable kayak that you choose to buy. However, a lower price point doesn’t necessarily mean that the kayak will be of lesser quality. In terms of durability, some of cheaper models we reviewed were made with just as much attention to detail. Usage: Some kayaks are designed for a lazy float down the river while others are built for performance with more control and maneuverability. If you’re looking for something able to handle a bit of both, the hybrid models will be a better choice. 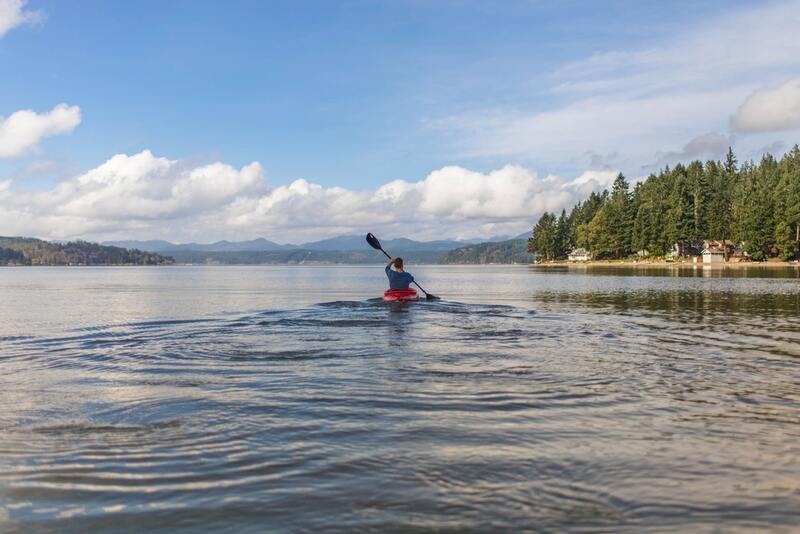 Portability: One of the most noticeable benefits of an inflatable kayak is the ability to store these compactly, making it a fast and easy solution for kayaking. Just about every inflatable kayak will fit in the trunk of a car and weigh anywhere from 5 to 70 pounds, however most models will land somewhere right in the middle. Set Up Process: Finding an inflatable kayak that takes more than ten minutes to set up isn’t an easy task with most models staying under that range. With that said, it would be a good idea to practice setting up your kayak at least once before heading out so that you aren’t stuck out in the sun straining over the instructions. The best inflatable kayaks reviews can be found in the section above. The latest prices are linked through so be sure to check out the current cost and shipping times. Don’t miss out on the fun an inflatable kayak can bring to your next outing. Basically you are saying-really quickly-what you would certainly tell your reader. Being visible may be the first important things.